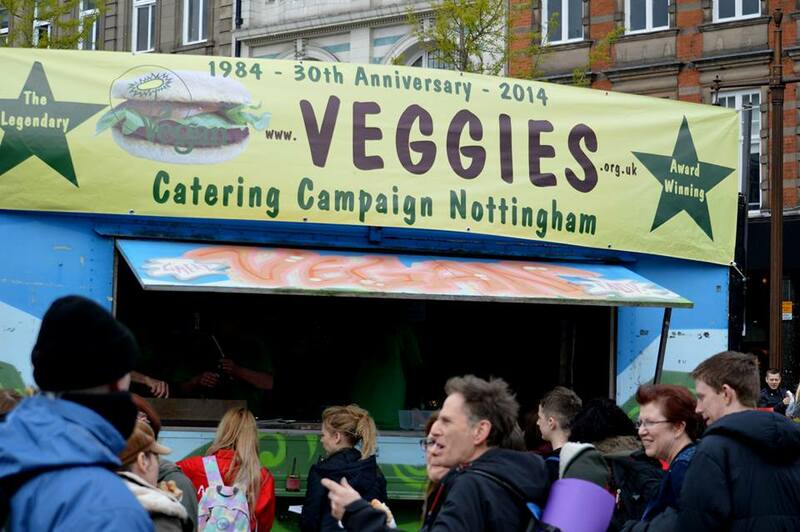 “Veggies Catering Campaign was set up in Autumn 1984 by four friends who were frustrated about the lack of vegetarian fast food available in Nottingham. 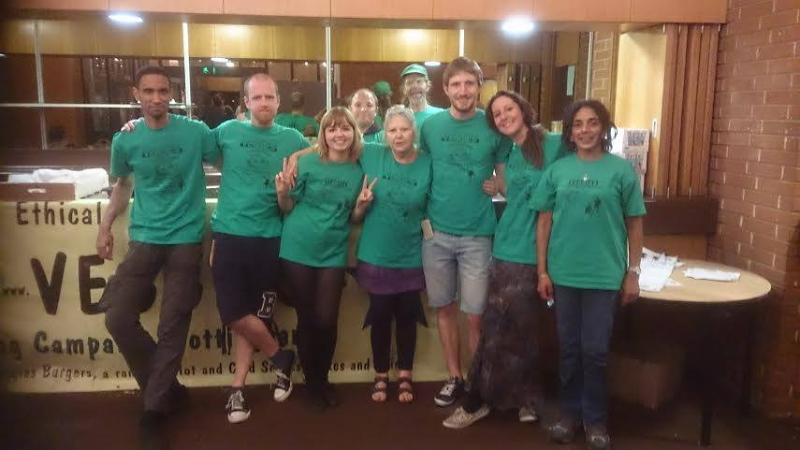 Their intention was both to provide an ethical fast food stall in the city, and to take the veggie message to a wider audience by participating in demonstrations and gatherings. 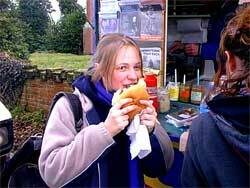 One of the first things the founders did was to take a giant veggieburger along to a Vegetarian Society protest outside the infamous Royal Smithfield show! “Veggies has grown and evolved quite a lot over the last  years, but the ethical message has remained the same. 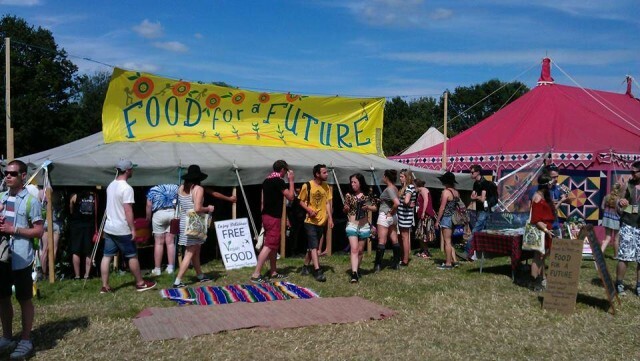 All food served has been vegan from the start, and as minimally packaged and locally-sourced as possible and practical. 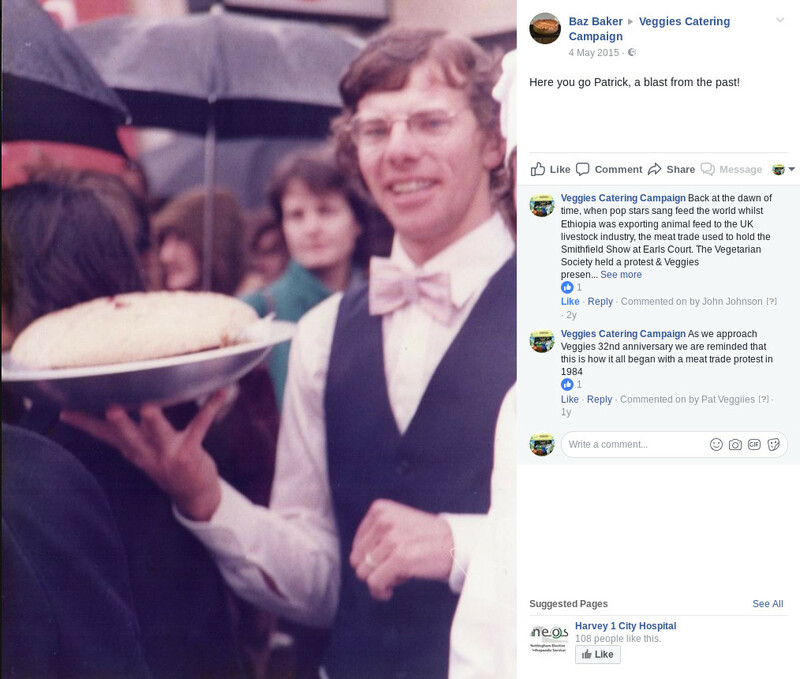 There is a long way to go to catch up with Peace News (first published on 6 June 1936), but Veggies of Nottingham have covered a lot of history since 1984. From catering in the guard’s van on a CND chartered train, to feeding the thousands at a Hyde Park rally against apartheid, how times have changed. In 1984, Tom and Clare from Nottingham’s animal rights group had the idea of presenting the manager of a local McDonalds with a huge veggieburger to represent an ethical alternative to the products of death and destruction sold there. 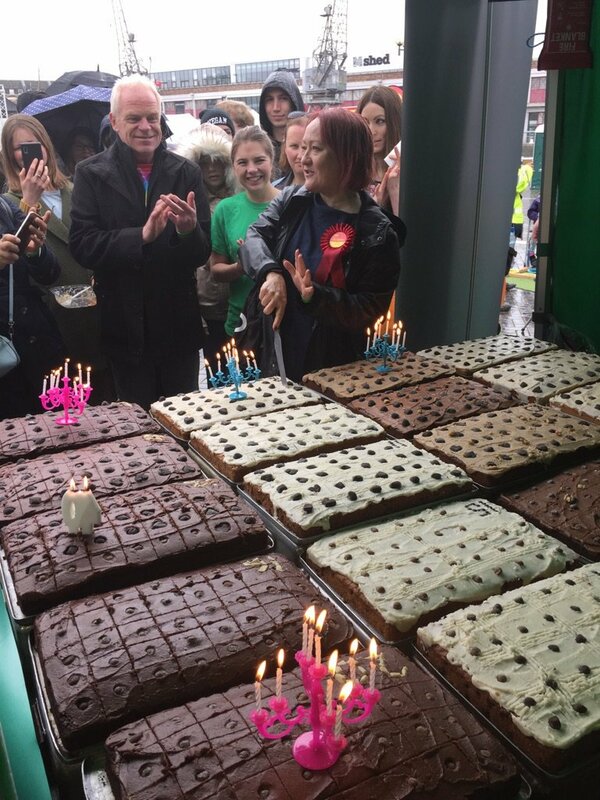 This was such a success that the logical next step was to do the same thing for the public every day, first from a mobile food van, then from early 1985 from a daily market stall, literally on the next street to McNasty. 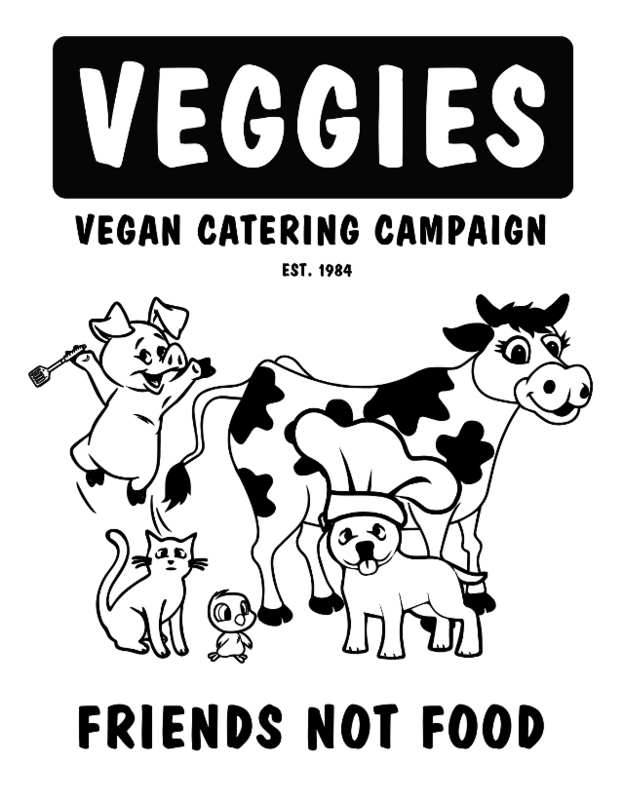 Veggies has been a streetwise catering campaign ever since, reaching a highpoint with the 2006 Vegan Society Award as ‘Best Vegan Caterer’. 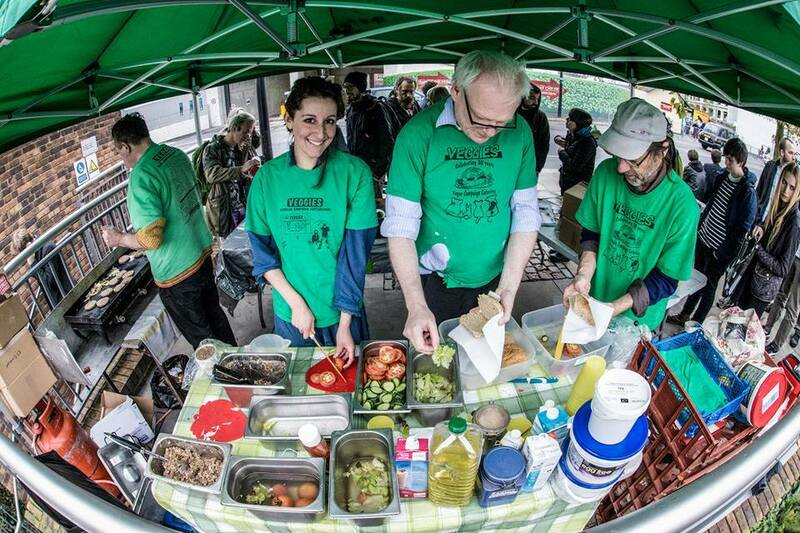 25 years of ‘campaign catering’ has kept Veggies on the front line. Whether driving along a drainage ditch to support campaigners protecting a peat moor, or jumping the barriers onto a reclaimed motorway, Veggies food always gets through. “While there are slaughterhouses, there will be battlefields”, said Tolstoy. This is why the vegan and peace movements are two sides of the same coin – “one struggle, one fight”, as they say in the animal rights movement. Veggies has been seen at Molesworth US military base on a snow-strewn February morning in 1985; at Menwith Hill, Fylingdales and Aldermaston; at Faslane 365 and now at Heckler & Koch offices in Nottingham, putting a spotlight on the world’s second largest supplier of small arms. Veggies and Peace News have woven a path together through the decades, from PN’s time in Nottingham, not 100 yards from Veggies’ base at the Rainbow Centre – now evolved into the Sumac Centre, one of the emerging network of independent social centres – to catering for the first Peace News Summer Camp, hopefully a permanent addition to Veggies’ summer tour, which also takes in the Animal Rights and Earth First Gatherings, Climate Camps and DSEi protests against the arms trade. It is appropriate that the Veggies anniversary events kick off with the 24th global day of action against McDonalds and everyone like them on 16 October. Veggies was conceived at a McNasty picket, saw off a legal action prior to the historic McLibel trial; and now, asking “What’s still wrong with McDonalds?”, calls on friends and supporters to join them in holding ‘free vegan food give-aways’ on their local high streets, or drop in with some fliers at any branch they pass on their way to the Veggies anniversary event “Party Like It’s 1984” at the Sumac Centre in Nottingham on 17 October. But before inviting the hundreds of campaigns and their thousands of supporters sustained by Veggies to join in the party, there is more to be done…. Not one, or two, but at least three simultaneous demos to be fed on that very same Saturday. Veggies Food will be/hopes to be at the National March Against the Fur Trade in London; at the launch of the latest campaign against the arms trade “Target Brimar”, in Manchester (see www.targetbrimar.org.uk) and at The Great Climate Swoop near Nottingham. Whilst the Swoop is pledged to occupy EON’s Radcliffe-on-Soar coal-fuelled power station during the 24 hours from noon on Saturday 17 October, when the job is done the party is just 12 miles away in Nottingham! If you miss any of this, there will be many more opportunities to share and enjoy Veggies? unique style of campaign catering, including the Peace News Winter Gathering at the Sumac Centre, 15-17 January 2010. 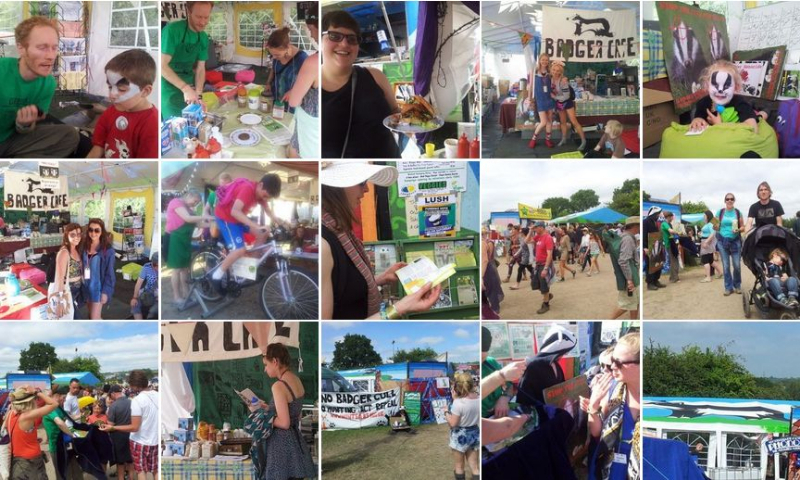 On 12 December, Veggies will be marking the Copenhagen Climate Campaign in the most appropriate way, by not traveling there, but rather organising locally with the Sixth East Midlands Vegan Festival at Nottingham’s Council House. By helping 100 people eat vegan, up to 200kg CO can be saved, and if ONE customer goes ‘Vegan For Life’, they could save 1.5 tonnes CO2 every year, as well as saving 4,022 animals’ lives, and helping all the world’s peoples to receive a fair share of the world’s resources. With livestock emissions held responsible for more damage than the worlds transport systems, it is seriously worrying that so many climate campaigns fail to call for such a simple and enjoyable step towards climate justice – “Go Vegan”, it’s Not Stupid! Pat is the master chef of Veggies and lives in Nottingham.